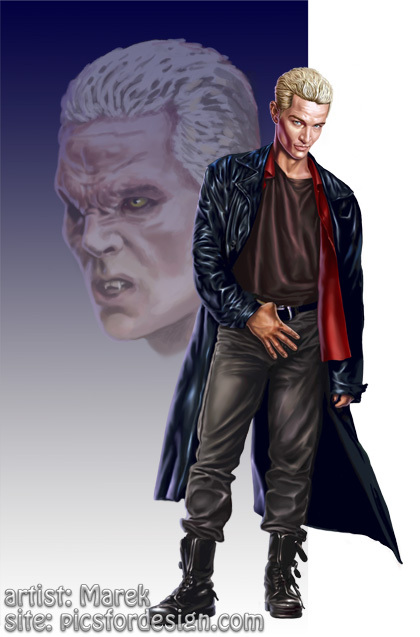 Here I'd like to draw Spike from Buffy the Vampire Slayer. What do you think he should be like? I want to make sure he's cool enough, yet you can tell he's a villain. Tell me what you think! Submitted by Celesta (not verified) on Thu, 10/06/2011 - 07:23. I would Love to thank you from the bottom of my heart Marek this Tube is well I am Speachless... I Love it!!!!! I do agree with the other only you could do the other Buffy Characters. They would go along great with Spike. But that is if you choose to do so. But thanks ever so. Oh and If you do make Willow you could do a good willow and a Dark willow she was so Awsome with her powers. Submitted by carol (not verified) on Wed, 10/05/2011 - 11:50. Submitted by Julie (not verified) on Wed, 10/05/2011 - 03:26. WOW! You made Spike absolutely PERFECT!!!! Gorgeous!! (Please do Buffy & Willow too & maybe Angel) WONDERFUL art!!! You rock!! Submitted by Cookie (not verified) on Tue, 10/04/2011 - 22:18. Thank you very much Marek :-) Love your work ! Submitted by Marek (not verified) on Mon, 10/03/2011 - 09:21. Will be done tomorrow, will make sure you are happy with it! Thank you very much for supporting, special thanks to Cookies!!! Submitted by Anonymous (not verified) on Mon, 10/03/2011 - 06:39. Submitted by Cookie (not verified) on Sun, 10/02/2011 - 05:53. Submitted by Julie (not verified) on Wed, 09/28/2011 - 22:23. Well, I just chipped in more money because I really want to see Spike completed (and hopefully a Buffy by Marek as well soon). Spike is awesome and he would be perfect for Halloween tubes. I hope you won't give up on this project! Please remember that these are difficult times financially for a lot of people. I hope people will give what they can, but I hate when a project is cancelled. Keep up the great art Marek! Submitted by JuliaAnderson (not verified) on Fri, 09/23/2011 - 11:11. Yes, it's one month. One month is given for a project to gather the required amount of money. Submitted by Celesta (not verified) on Thu, 09/22/2011 - 03:52. Is there a time limit to get the funds up to it's goal?